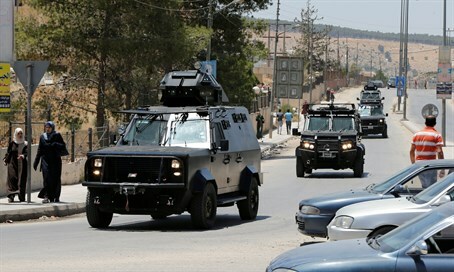 Jordanian security forces arrest a suspect in the attack on a security office in Baqaa, near Amman. Jordanian security forces on Monday night arrested a suspect in the attack on a security office in a Palestinian Arab camp that left five dead, including three security officers, Jordanian state television said, according to Reuters. Security forces said a major manhunt was launched following the attack at the Baqaa camp early on Monday. The attack reportedly took place at an office of the General Intelligence Department in the camp, located on the outskirts of the capital Amman, at 7:00 a.m. Monday morning. "Palestinian refugee camps" in Jordan are in fact built-up neighborhoods, which house the descendants of Palestinians who fled Israel during Arab invasions of the Jewish state. In Jordan, as in most other Arab countries, Palestinians are segregated from the rest of society in an attempt to preserve their "refugee" status as a political weapon, and often complain of discrimination. There are similar “Palestinian refugee camps” in Syria and Lebanon. In both countries, these neighborhoods have been targeted by sectarian violence.